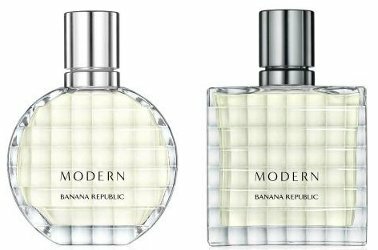 Banana Republic will launch Modern, a new "sophisticated yet easy-going" fragrance duo, this month. Modern Woman ~ developed by perfumer Jerome Epinette and celebrating "Banana Republic's California heritage". Notes for the watery fruity floral include bergamot, waterlily, apple, peach, rose, cyclamen, jasmine, patchouli, crystallized musk, powdery white amber and vanilla. Modern Man ~ developed by perfumers Irina Burlakova and Vincent Kuczinski, with "a juxtaposition of cool and spicy aromatic synergy". Notes for the aromatic musk include sparkling watery accord, red seaweed, juniper, grapefruit, Japanese radish, cyclamen, tamarind, patchouli, solar musk, vetiver, white birch and incense. Banana Republic Modern Woman and Modern Man will be available in 50 ml. MW sounds boring. MM sounds like a hot mess. Yeah. Not the most compelling release of the year.